Celebrate the award-winning work of men and women incarcerated in detention facilities across the country. The evening will feature actors and writers reading submissions from PEN America’s annual Prison Writing Contest. This year, the program will also include readings of submissions from PEN’s inaugural Post-Release Writing Program for Women. 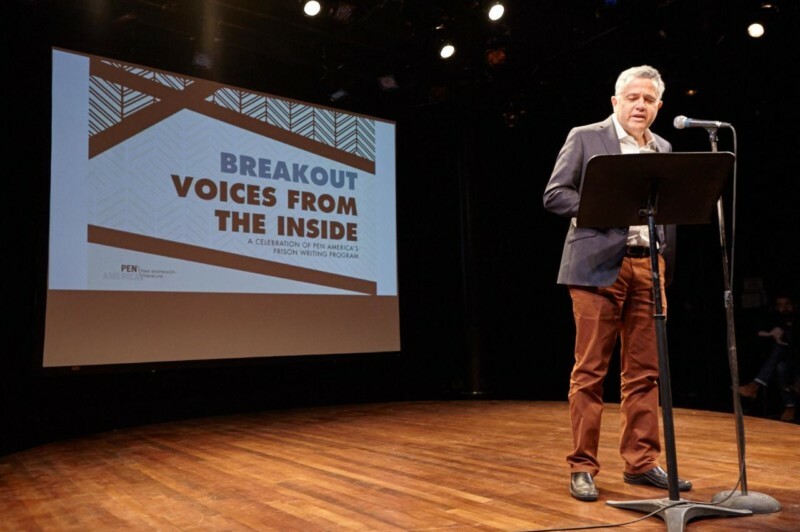 The annual event is hosted by the PEN Prison Writing Program, which recognizes the power of creative expression as a form of liberation, and inspiration for the audience. Can’t attend? Watch a live video stream here beginning 6pm ET. Jeffrey Toobin, bestselling author of The Nine, Too Close to Call, A Vast Conspiracy, and The Run of His Life. He is a staff writer at The New Yorker and the senior legal analyst at CNN. Eisa Davis, award-winning actor, writer and singer-songwriter working on stage and screen. She was a finalist for the Pulitzer Prize in Drama for her play Bulrusher, and wrote and starred in Angela’s Mixtape, named a best of the year by The New Yorker. Emanuel Xavier, the author of the novel, Christ Like, the poetry collections Pier Queen, Americano: Growing up Gay and Latino in the USA, If Jesus Were Gay & other poems, Nefarious, and Radiance. He was named an LGBT History Month Icon by the Equality Forum, a nonprofit organization whose mission is to advance national and international gay, lesbian, bisexual and transgender (LGBT) civil rights through education. Rebecca Carroll, a Guardian US contributing opinion writer and a producer at WNYC focusing on race in New York City. She is the author of several nonfiction books, including Saving The Race and Sugar In The Raw. Daniel José Older, New York Times bestselling author of Salsa Nocturna, the Bone Street Rumba urban fantasy series from Penguin’s Roc Books and the Young Adult novel Shadowshaper (Scholastic, 2015), a New York Times Notable Book of 2015, which won the International Latino Book Award and was shortlisted for the Kirkus Prize in Young Readers’ Literature, the Andre Norton Award, the Locus, the Mythopoeic Award, and named one of Esquire’s 80 Books Every Person Should Read. Anthony Papa is an artist, writer, freedom fighter, noted advocate against the war on drugs and co-founder of the Mothers of the New York Disappeared. Mr. Papa is the author of This Side of Freedom: Life after Clemency. He is a frequent public speaker and college lecturer on his art and criminal justice issues. Currently, he is manager of media & artist relations for the Drug Policy Alliance.